This will be the first of a series of articles ahead where I will present my views of the world and Singapore’s economy. For readers who are more sensitive, maybe it can be potentially controversial. Why? Well, opinions or predictions can always be controversial especially when people start to get too excited and serious about it. I will appreciate if readers can treat these articles casually and maybe even with a tad of fun. Please do not be overly affected by it. The whole idea of my writing here is to provide a view so that we can think out of the box in an unconventional way. Who am I to give my views of the world? I am not a great political leader. I am not legendary investor. I do not even have my own business! I am just an employee who scaled corporate ladder. Perhaps my slight edge is the experiences gathered from my traveling to a fair bit of places around the world. It's not plain tourism but the understanding of the countries' cultures via dealings with the locals. Places includes different parts of China, India, Europe, US, Brazil, Middle East, South East Asia (Malaysia, Indonesia, Thailand, Vietnam), Japan, Korea, Australia etc. The one continent I have not been to is Africa, although I do know a few South Africans. Today, the world is in a pretty unusual situation with a wide range of uncertainties! The recent Brexit came somewhat shocking to the world. Donald Trump as President of US today is no longer a myth compares to a year ago as he has officially accepted the Republican party presidential nomination. In fact, since the start of millennium, we had undergone a series of major disastrous events globally. They are the Dot.com crash, 911 attacks, War in Afghanistan and Iraq, SARs epidemic, Global Financial Crisis, Arab Spring, European Debt Crisis, Oil Crisis and ISIS threat of today. To top it all, Venezuela is heading towards humanitarian crisis with food and medicinal supplies shortage while North Korea continues to showcase their nuclear tests putting the world into fear. Read: Venezuela - A Nation of Beauty Queens; Now A Nation of Hungers! Who will have thought this will happened? Of all places in the world, Singapore is still considered a relative safe country. However lest we forget that being a small city that depends heavily of global trade, we will not be shielded if economic crisis befell on our major trading partners. And being close allies of the western world, we are definitely prone to terror attacks as well. In order for us to see the future more clearly, we need to understand what exactly happened in the past. As Winston Churchill puts it “The farther back you can look, the farther forward you are likely to see.” So let us revisit what has happened going back into the past. The initial fear just before the turn of the millennium was the Y2k problem also known as the Millennium bug potentially causing disarray in computer programs. Yet, in reality, the real problem was the euphoria of the Dot.com stock market, which led to the biggest ever tech stock boom and bust. Nasdaq hit the climax of 5,132.52 on Mar 10, 2000. Just one year before, it was at 1,700-1,800 points and five years earlier it was approximately a fifth of its peak. Many companies were not even having any earnings and yet the market's PE ratio ridiculously topped 100. The tech bubble burst and many companies folded. This crash of the stock market was worsened by the Al-Qaeda 9/11 twin towers attacks of 2001. Nasdaq index plummeted to below 1,300 on Sep 2002. This will later led to the U.S. President George Bush declaring War in Afghanistan and in Mar 2003, US and her coalition army invaded Iraq on grounds that Saddam Hussein's Iraq had weapons of mass destruction. Saddam Hussein was captured and executed thereupon, but no signs of weapon of mass destruction. 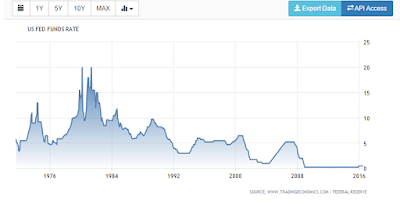 The few years of economic distress at the start of the 21st century led to the then US Fed Chairman Alan Greenspan (in office from 1987-2006), to drastically reduced Fed Fund rates several times from a high of 6.5% in May 2000 to a low or 1.0% in Jun 2003. The easy Fed monetary policy provided enormous thrust to the US and the global economy, which inadvertently led to the biggest Real Estate Subprime bubbles that resulted in the 2008/09 Global Financial Crisis (GFC). Ostensibly, the problems already begun in 1971 when then U.S. President Nixon took the US dollars off the gold standard, leading to the fiat monetary system of today. 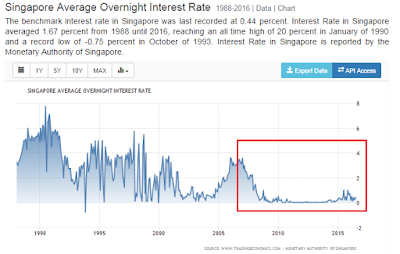 Turning the attention to Singapore, the last ten years or so had been an economic fairy tale for Singapore. Don't believe? In US$ terms, our nominal GDP appreciate 85% from 2005 to 2010. The next 4-5 years seen another stellar 30% rise of GDP. In a ten year period, our nominal GDP expanded a remarkable 143%. Singapore's GDP per capita in 2014 is US$56.3k (S$71.3k) making us one of the richest country in the world. Since the SARs crisis in 2003, Singapore's economy grew at an increasing rate. Being an open economy we were obvious beneficiaries of easy global monetary policies. If you refer to the below chart, you can see the incredible rise of Money supply in Singapore over the last two to three decades. 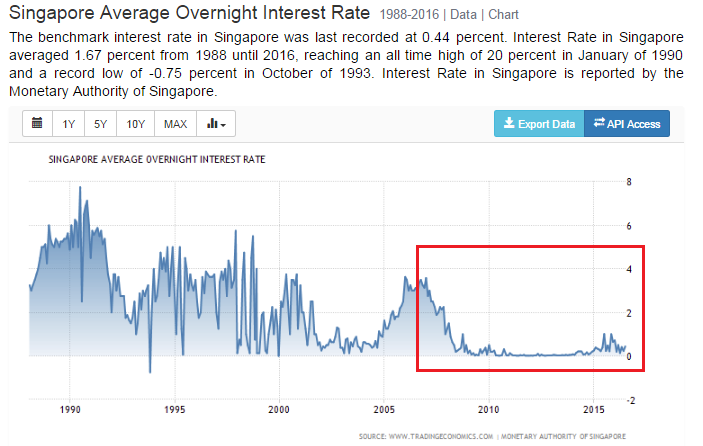 In the next chart, you can also see that average overnight interest rate had fallen to near zero after the financial crisis. In the face of a booming economy and facing labour shortage, Singapore government loosened immigration policy. This led to an influx of supposedly cheaper foreign labour to supplement the shortfall. Below is a table extracted from singstat.gov.sg to show the key demographics of Singapore from year 1970 to 2015. To further breakdown in the table below, you can see that the last 15 years growth of foreign labour from year 2000 to 2015 is actually higher than the 30 years period from 1970 to 2000. From 2004 (after SARs crisis) to 2008, businesses prosper and rich becomes richer! Salaried middle class workers did well too in nominal terms. The lower class though, as it always is, lagged behind the leading pack and becomes worst off as the economy inflated in prices. Expectations of salary were barely in checked. Almost everyone think that they were underpaid due to the rising median income and of course, the rising cost of living too. Most wanted to assume managerial posts with higher than respectable salary. Yes, even those who had only freshly entered the workforce for a few years were having extremely high expectations. Did productivity really increase at a faster rate? In reality, capabilities and work experiences lag behind salary increase. Yes, productivity increased but arguably in my opinion at a much slower rate compare to the eruptive growth of the economy caused by leverage of easy money and the influx of foreign labour. Economic progress seems all-important for the high-handed ruling party in their quest to become a world class country of economic success. The intangible social impact was neglected leading to PAP narrowest victory over the opposition since independence in the 2011 Singapore general election. The country was enjoying one of our best economic success leading up to the GFC. A mere seven years ago in 2008/9, we had just encountered the worst financial crisis since WW2. 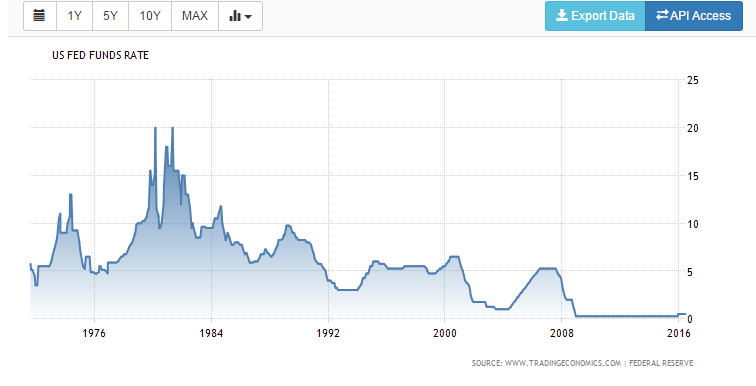 Some compare the GFC with Great Depression in 1930s and the Japanese real estate bust in the 1990/91. The main difference comparing with the Japan crisis was that back then, the crisis was limited to a single country. In retrospect, the GFC is global in scale due to the interconnectivity of the world today, as well as qualitative more severe. In 1929, total debt in US was 160% of GDP increasing to 250% by 1932. In 2008, the US's total debt was an astounding 365% of GDP, in which this calculation excludes the pervasive use of derivatives absent in the 1930. Yet, barely a year after the collapse of Lehman's brothers, financial market stabilized, stock market rebounded and economy recovered. It's back to business as usual. While the historical Great Depression and Japan real estate and stock market busts lasted for decade long, the adverse impact of GFC was short lived, thanks to the artificial support that Central bankers introduced by dishing out a series of QE globally. 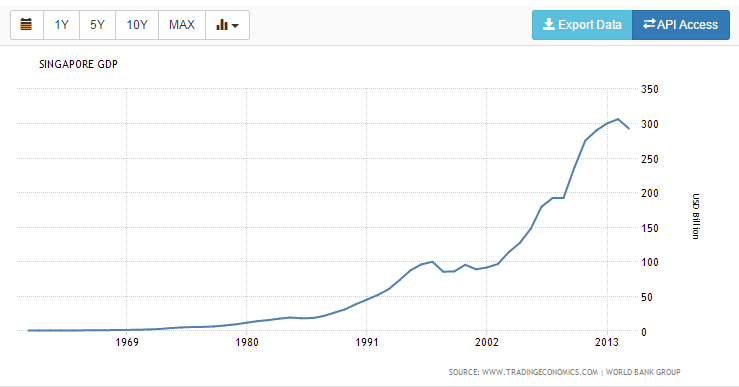 Refer to the chart below which shows the massive monetary base growth after the GFC. Hence, the six to seven years of post GFC period had been an astoundingly and unusually successful one. Thanks to the zero interest rate environment led by US Fed chairman Ben Bernanke (in office 2006-2014), the global economy recovered quickly. Real estates in China, London, Singapore and Australia etc all boomed. Stock markets globally rallied. In the main, it was China driving the world economy, constructing new apartments, roads, railways, irrigation, sewage systems, commercial centers etc largely driven by State-owned Enterprise (SOE). And this was of course fuelled by the cascade of debts pouring out from the central bank. In particular, the ballooning shadow banking which is the unregulated credit in nonbank entities within the country has been a specter! Stock market today is still at relatively high levels. This is not just comparing to period of GFC but even when reference to pre-crisis peak. Dow is mid 18,000s today while in 2007 peak, it was only barely hitting 14,000 points. It is the same bull case for Nasdaq peaking at >5,000 points compared to the pre-crisis of 2,800 points. Markets in Asia and Australia were slightly more modestly priced today due to the worries of China engine running out of steam having more than significant impact to regions here. This is especially after Black Monday in August 2015 when China surprised the world with the devaluation of their yuan. As a 平民百姓 on the street, I noticed that compared to yesteryears, the number of cctv cams had increased exponentially from certain areas to every area of Singapore. And in recent years, there's been an increase of crimes in Singapore. Low crime doesn't mean no crime. Also more sophisticated crimes with the improve of technology. So sophisticated that its just a piece of paper to rob a bank! Looks like only us market is growing! Yes, US market is pretty overpriced now! so even other market has done so badly recently. if us market drop, then we will also drop? but the brexit news make Europe and US dropped quite a few days and singapore only drop one day 60++ pts . then the 2nd day, it didn't drop much. could it means that china,sg, HK has dropped enough then now these market seem attractive?? Sg stock market is hugely dependent on US and China. US is pretty much global, just look at its impact during GFC. China too, just look at last Aug when they devalued. Brexit is an important piece of news but still nowhere near the impact of US and China. Also, for Brexit to be effected, it will take two years to negotiate UK's departure with EU. Whether Sg, HK, China have floored, I doubt so. Using the PE as a gauge, it is reasonable priced but not dirt cheap! STI is around PE 12. That said, current PE means nothing bcos if economy is in a recession, earnings will drop and hence forward PE is more important. All I can say is market volatile now. Volatility means it can either swing up and down. But looking at the current situation so far all the downside swings are larger than the upside! Therefore keep sufficient cash to advantage of the downside if it happens. If it doesn't, at the most you don't win that much n it probably hurt less than when u lose a lot! Just my humble opinion. a lot of stress build up. when you see more and more incidents of shootings and vehicular attacks, it means the stress is so tremendous to push people over a threshold. average citizens in developed markets DM are favouring changes. brexit occurred and recent polls show once you conduct it anonymous, you have more preferring trump. not so inconceivable anymore. "Donald Trump as President of US today is no longer a myth compares to a year ago as he has officially accepted the Republican party presidential nomination." 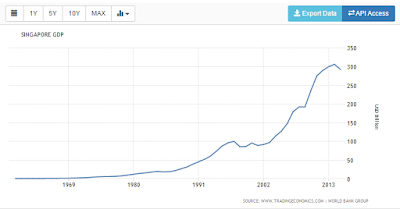 I fear the past 20 years had been an unprecedented confluence of factors favouring Singapore's GDP growth and incomes. Moving forward, i fear that is about to come to an end. 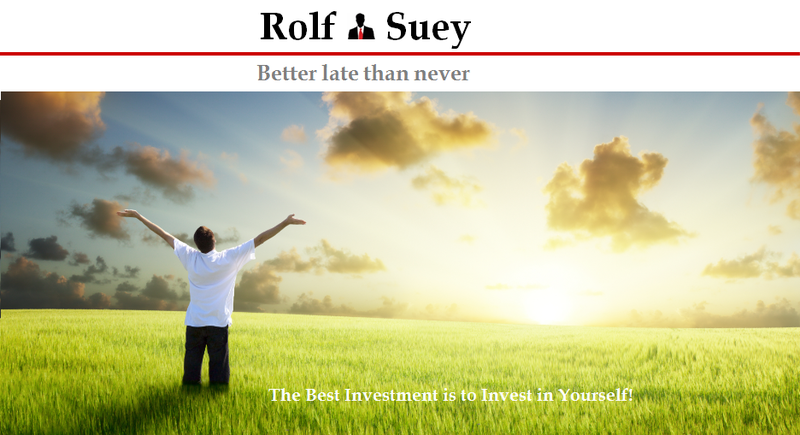 "Turning the attention to Singapore, the last ten years or so had been an economic fairy tale for Singapore. Don't believe? " yes and attitudes towards immigration has shifted since 2011.
and I think the average singaporean is actually overpaid though there are some fundamental communications skills the average singaporean has that is above their global peers in the region. "To further breakdown in the table below, you can see that the last 15 years growth of foreign labour from year 2000 to 2015 is actually higher than the 30 years period from 1970 to 2000.
increase in productivity leads counterintuitively to lower employment rates. and thus lower mean income of the whole population. leverage of easy money does not lead proportionately to income growth but rather asset prices inflation. Property is one area. Stocks is another. "In reality, capabilities and work experiences lag behind salary increase. Yes, productivity increased but arguably in my opinion at a much slower rate compare to the eruptive growth of the economy caused by leverage of easy money and the influx of foreign labour. " and the funny thing is that it CAN end safely but it depends on a lot of factors. "Hence, the six to seven years of post GFC period had been an astoundingly and unusually successful one. " I still think it was mainly the liquidity. "In the main, it was China driving the world economy, constructing new apartments, roads, railways, irrigation, sewage systems, commercial centers etc largely driven by State-owned Enterprise (SOE). And this was of course fuelled by the cascade of debts pouring out from the central bank. In particular, the ballooning shadow banking which is the unregulated credit in nonbank entities within the country has been a specter! " this is just the hot money circulating. they will continue to flow around for a while, elevating country after country until CBs (central banks) either reach a conclusion of the NIRP or ZIRP is not working or they restart fiscal policies. however, volume is dropping and VIX is low and fund managers are reducing their equity allocations so time will tell if they can entice money into the markets further or this is just baseless pricing without demand. don't forget the stock market is still a market meaning supply and demand and all sorts of crazy bidding. meanwhile, even while I wonder how long can it last, until the evidence states otherwise, I am staying bullish on us equities. Markets in Asia and Australia were slightly more modestly priced today due to the worries of China engine running out of steam having more than significant impact to regions here. This is especially after Black Monday in August 2015 when China surprised the world with the devaluation of their yuan. " Indeed I agree with u that stress build up triggers pple over their limit. Seeing this stress build up triggered me into writing this article. Thanks for the MAS website. It's useful! Yes, we need to be careful on our expectation of the income! Singaporeans must not think we are superior bcos our income is rising. We should constantly find our niche to be useful as a person to the company and to be useful as a country to this world!!! Raising productivity requires good focus on re-training too, otherwise yes, many will be jobless! For this, I think govt is doing good. Whoo... our property price is definitely inflated out of proportion. Whether it will come down, I m not sure bcos prices sometimes is a function of perception and not reality! Whether it can end safely, Ray Dalio describes it as "beautiful deleveraging!" Liquidity - Absolutely! makes the rich richer and the poor poorer without justification of working harder or more productive! N/ZIRP is absurd! Punish good people who saves! What humans are doing now, even in the eyes of religion, it is pretty much blasphemous! Pay back time may be really ugly if it ever happens! CBs still have lots of ammunition to stimulate the market - eg giving every household a cheque to spend! Still sometime before humans run out of solution. The stock market is run by perceptions and not reality. If we already can have negative interest rate, Dow crossing 20k will not be jaw dropping! helicopter money can successfully bring a country out of the doldrums in a short time for a short time, given their demographics and economy are in place (plugged into the world, growing skilled base - skills not education the way forward). but it must not be blatant. 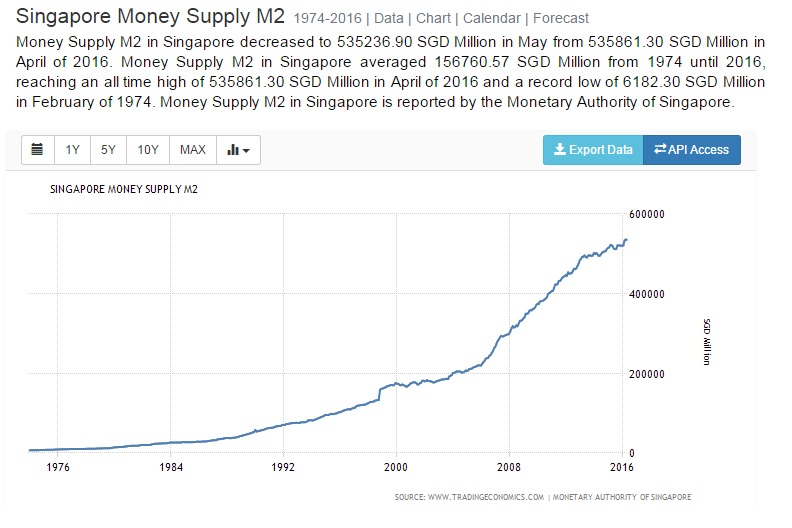 blatant rapid monetary supply expansion rapidly leads to disillusionment of the monetary standard. ie. hyper inflation and flight to primitive/ancient standards of money. "CBs still have lots of ammunition to stimulate the market - eg giving every household a cheque to spend! Still sometime before humans run out of solution." we are in unchartered terrority. it is the speed of sentiment osmosis and inflection point of sentiments. every point in history, people can stay alarmed for long periods of time before something changes. witness 2001-2007 and 2009 to today. "The stock market is run by perceptions and not reality. If we already can have negative interest rate, Dow crossing 20k will not be jaw dropping! " Thanks for the article. I am also in the belief that stocks will continue to rally until a bubble point! Now there is still no clear signs of bubble for that to burst. In anycase, I just want to protect myself against the downside to be more prudent! I remember an article on the huge depression. The poor and medium income suffers greatly. 10 years ! We were actually lucky Ben studied on this history and print the world out so quickly. Yes some of the rich benefits instead of going bankrupts. So whats. Is still a lot better than we spiral into depression. Infact with inflation, those who holds most cash lose out and this includes the rich which suffers alot more than one who is cashless. Sorry, I am going to have a long comment. Not that I am agitated but just that I know it's not easy to convince... And hopefully the below reply makes some sense to u, otherwise just ignore! If the world is better off it's definitely better. I will definitely be happier. I m not boasting but frankly I have been spending hours and hours reading through history and great depression, GFC and many other books and videos in the last year or so. The more I research the more I know, the more I am worry! The biggest worry now is if the world can be "indefinitely" better off due to the artificial support? If you hear out from Alan Greenspan who is Ben Bernanke's predecessor for close to 20 yrs as Fed Chairman, he had been constantly for last 8-10 yrs warning of the bigger bubble that is awaiting to be burst! Have u ever wondered why did Ben have to step down after less than 10 yrs when Alan Greenspan is in office for close to 20 yrs. Perhaps GFC will only be sufferings for 4-5 yrs before it recovers, but if ever the next big bubble is going to be burst, the biggest worry is it will be worst than depression and it can lasts even longer. Today the global debt is so huge compared to the Great Depression's time that if anything bad happened it's going to be not just undesirable but painfully scary! Of course, I hope it will not take place and with all my prayers, I hope that you or Ben Bernanke can be right! Ok, still there will be people argue that all the above-mentioned just have their own agenda and opinions may not be true! Does not matter, just ignore! I focus on historical facts and reason, that is why I am aligned to these guys rather than the bureaucrats, politicians and academics. By the way, I benefited greatly from the last 10-15 yrs of cheap money myself. My earnings as an employee are exponential that nowadays I also think it must be something not so right! So why am I complaining? It boil down to my own principle of if I know something important, it will not just for myself only. But with all my heart and sincerity, I m not doing what I am doing now for me. I stand to gain nothing. It's better writing what people love to hear and then it's easy to be popular and can even start a school or earn income from ads! All I want is just hope that more people in Singapore or this world can be warned of a potential headwinds ahead if any. If not, doesn't matter because still we are all good and I am happy. If one day in future, something happened, and if u suddenly remember this article and somehow it helps u in advance in someway or another to avoid something, I hope u can drop me an email! Otherwise just ignore, and I know I risk losing a potential reader. By the way, how about holding gold and silver than cash? Holding cash or precious metals is silly to me in the long term. It does not generate anything. But that is not the whole point! What makes sense is what cash and gold and silver can purchase when stocks or real estates get cheap! Hope to gets your reasonable feedback if any? Whatever QE or Depression, etc...., the rich is always better off. Nobody can fault them or that. I agree and I am not complaining, because I am also a big beneficiary of the boom in the last decade or so. it's always the middle class that suffers the most. The poor are already poor in any case, and so even depression they will still be poor anyway, hence impact is lesser. So let's just hope that if any unexpected crisis takes place Sg a country with most middle class will not be too badly hurt. You cannot educate the top 20% because they know how to take care of themselves already. The bottom 20% are so uneducated that it's hard for them to be educated in time to be useful. The middle 60% is those that matters! And this is a blog where I hope I can help in a anyway possible to spread what i know to the middle 60%! Though it's not easy because of the inherent characteristics of human beings since Evolution. U sound real serious. Chill. Many times I try to explain myself that i am chilled, many times people still think that i am very serious and agitated. I always attribute it to writing or face to face meeting which body language or facial expression can tell if you are truly chilled or not rather than "writing"
Yes, it's like steroids, but is it good or bad huh? By the way, what do you mean by anti-establishment momentum? Steroid is good when accompanied by other treatments. It relief the acute pain when adminstratjng the longer term treatment. If QE buys time for fiscal and structural reforms like labour etc... Then it's good. If it's just printing money then to hell with it. I know u are right, we will be worse off if we tighten our tap on foreigners, Brexit or whatever. but hey, win u win back, I get a pittance like I am a beggar.